Benign laryngotracheal stenosis (LTS) is an umbrella term encompassing partial or complete cicatricial narrowing of the endolarynx or trachea or both. Prolonged endotracheal intubation forms the single largest cause of benign LTS. Management of LTS has always posed a significant challenge to the otolaryngologist because the complexity and delicate nature of airway structures such as vocal cords, respiratory mucosa, and recurrent laryngeal nerve make any surgery in this region difficult. A developing country, such as India, poses additional challenges in the form of lack of enough Intensive Care Units (ICUs) beds, low doctor-to-patient ratio, low socioeconomic status, and poor hygiene, tendency to poor follow-up, and increased prevalence of multidrug-resistant infections. We embarked on the present study to understand the clinical profile of patients presenting to an Indian tertiary care setup with LTS. We describe our philosophy of precise airway assessment in such patients. The role imaging in LTS has also been discussed. The outcome of treatment in these patients, who were managed by endoscopic (conservative) and various external surgical procedures, has been analyzed. This study was carried out in the Department of Otolaryngology at King Edward Memorial Hospital, a tertiary care referral center between 2011 and 2016. KEM hospital ethics Committee approval was taken. The article presents a review of all the patients of LTS treated during this period. All patients underwent an accurate laryngotracheal assessment to determine the extent of involvement of larynx and trachea, the mobility of the vocal cords and the presence or absence of tracheomalacia. We performed an elective or planned assessment of the laryngotracheal complex in patients presenting with a preexisting tracheostomy. However, patients who presented to us with stridor/respiratory distress (compromised airway) underwent an emergency evaluation of the airway to establish the cause, site, and severity of airway obstruction to determine and plan further management (including tracheostomy if required to secure the airway). At least seven patients presented to us with stridor and revealed bilateral vocal fold immobility on indirect laryngoscopy. They underwent suspension microlaryngoscopy under general anesthesia, wherein the neurogenic etiology was confirmed, after which we performed unilateral CO2 laser posterior cordotomy (Kashima's operation). These patients were excluded from the present study on LTS. Vocal cord mobility is assessed by indirect laryngoscopy using a 70° rigid endoscope in adults. In infants and children, awake or asleep transnasal fiber-optic laryngoscopy (TNFL) is used for dynamic airway assessment to determine vocal cord mobility. One must observe for the slightest flicker or movement of the cords (the side of flicker should not be touched if one plans for Kashima's cordotomy). Zero-degree endoscopic assessment under anesthesia – the larynx is adequately exposed using MacIntosh laryngoscope with its blade resting in the vallecula. A rigid 4-mm Hopkins rod-lens telescope is used to visualize endolarynx, subglottis, and trachea. Site of airway narrowing is first determined. Stenosis is then assessed regarding grade and length. Myer-Cotton grading is used to describe the severity of subglottic stenosis. Length of stenotic segment is determined by inserting the endoscope to the upper and lower margins of stenosis and making markings on the endoscope. In a tracheostomized patient, the endoscope is inserted through the stoma to count the number of uninvolved, healthy tracheal rings low-down up to the carina. Retrograde endoscopy through the site of tracheostomy is done to assess the number of normal tracheal rings, if any, from the lower margin of stenosis to the tracheostoma. A diagram with all the measurements is added to the endoscopy report. In patients with vocal fold immobility, a neurogenic cause is differentiated from posterior glottic stenosis (PGS) by suspension microlaryngoscopy. The Lindholm self-retaining retractor is placed at the level of false cords and opened. The interarytenoid distance is restored to its normal size in neurogenic vocal cord immobility, while it remains narrow in PGS with scar tissue visible in the inter-arytenoid region. An angulated probe is further used to establish the severity of PGS using Bogdasarian's classification. Surgical interventions included endoscopic and external techniques. Endoscopic management is reserved for patients with recent-onset thin and membranous stenosis. Radial incisions in the stenosis are made using cold instruments followed by dilatation using either tapered bougies or increasing diameters of rigid bronchoscopes. A cotton swab soaked in 1–2 mg/ml of mitomycin C is applied topically to the site for 1–2 min. Betamethasone cream is applied at the site of stenosis using a cotton swab. The patient is reassessed under anesthesia after 10–14 days, and endoscopic treatment is repeated, if required. In case of recurrence of stenosis to the same or worse grade, open surgical intervention is considered. Laryngotracheal reconstruction (LTR) with cartilage expansion (anterior and/or posterior cricoid split with costal cartilage grafting) is reserved for mild-to-moderate grades of subglottic stenosis (Grade II and early Grade III) or combined glotto-subglottic stenosis. Partial cricotracheal resection (PCTR) is the preferred surgical technique for severe grades of subglottic stenosis. When subglottic stenosis coexists with glottic involvement in the form of posterior glottic stenosis or cicatricial fusion of vocal cords, PCTR is combined with posterior cricoid split and costal cartilage grafting, otherwise known as extended-PCTR. LTR and extended-PCTR require a period of laryngeal stenting for about 3 months. We have consistently used the LT-Mold as a laryngeal stent. Tracheal resection and anastomosis (TRAA) was the preferred surgical option for tracheal stenosis. In cases where the length of stenosis precluded segmental resection of trachea, tracheoplasty with anterior costal cartilage grafting and T-tube stenting was done. For milder grades of short-segment tracheal stenosis or where the location of stenosis in the lower trachea precluded segmental resection-anastomosis, Montgomery T-tube stenting was performed after incising the stenotic segment vertically and releasing the fibrosis (Shiann-Yan Lee technique). T-tube stenting was maintained for 3 months. In cases of acquired benign tracheoesophageal fistula, we perform fistula division with primary esophageal closure and tracheal resection-anastomosis as a single-stage surgery. In PCTR, interrupted 4.0 vicryl sutures were used for posterior anastomosis, with knots tied inside the lumen. Two lateral 2.0 Vicryl sutures were placed at the inferior and posterolateral edge of the cricoid plate to secure the trachea in place and to release the tension at the site of anastomosis. For thyrotracheal anastomosis, we used 2.0 Vicryl sutures with the knots tied outside the lumen. In tracheal resection with end-to-end anastomosis, we used 3.0 or 4.0 Vicryl sutures for the membranous part and 2.0 Vicryl sutures for the cartilaginous part. A total of 106 patients with benign LTS were treated at our institute between 2011 and 2016. There were 72 males (67.9%) and 34 females (32.07%). A total of 33 patients (31.1%) belonged to pediatric age group (<12 years) and the rest 68.9% were adults. [Figure 1] shows the etiological factors responsible for LTS in our patients. By far, postintubation stenosis forms the largest group (70.7%). The single most important cause of intubation in this group was organophosphorus poisoning. Of 106 patients, 21 (19.8%) were referred to us for revision following an intervention done outside. The probable cause of failure in these patients was multiple laser interventions (14), T-tube-induced stenosis (6), and suprastomal collapse (1). These patients were classified according to the site of stenosis into various groups [Figure 2]. 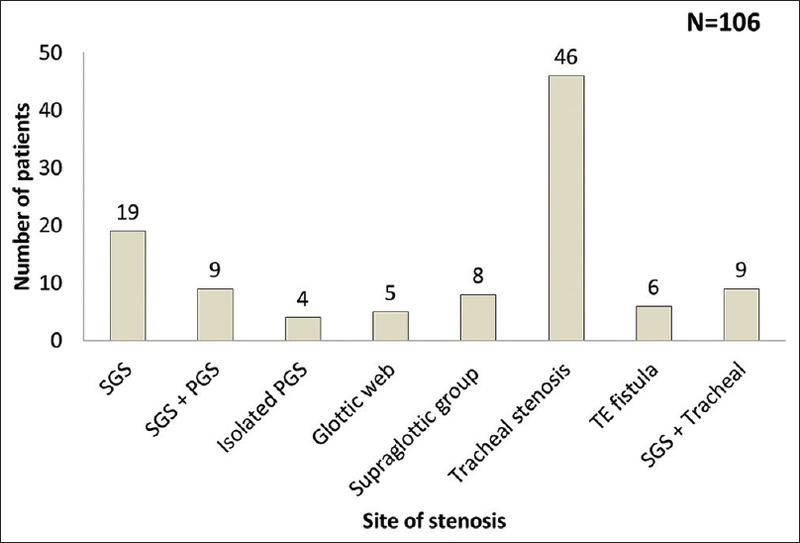 Tracheal stenosis formed the largest group (43.4%) followed by subglottic stenosis (26.4%). The treatment was tailored to the site, grade, and length of stenosis, patient comorbidities and history of previous interventions. The various interventions along with the treatment outcomes in different groups of patients are summarized in [Table 1]. A total of 12 patients were successfully managed by endoscopic techniques, which included (a) release of thin, web-like stenosis by laser or sickle knife followed by dilatation in seven patients and (b) only bougie dilatation in 5 patients. A total of 5 patients underwent LTR or expansion laryngoplasty with costal cartilage grafting and LT-Mold stenting. Of these, one remains tracheostomized; a young man with post-radiotherapy glottosubglottic stenosis who underwent LTR with LT-Mold stenting for 3 months. However, he developed aspiration and dysphagia after LT-Mold removal. Endoscopy revealed subglottic tracheoesophageal fistula with cricopharyngeal stenosis. He has subsequently undergone multiple esophageal dilatations and awaits further intervention. Among patients who underwent extended-PCTR, a child of 4 years with Grade 4 subglottic and PGS, expelled her LT-Mold spontaneously at 25th postoperative days. Subsequently, she developed restenosis for which a revision extended-PCTR was performed with long-term LT-Mold stenting for 10 months. She developed airway edema and granulations which are being managed conservatively. At present, she tolerates a full tracheostomy block and is awaiting decannulation. Among patients who underwent laryngofissure with web release and costal cartilage grafting with LT-Mold stenting, a boy aged 4 years expelled his LT-Mold after 2 weeks. Revision laryngofissure was done to reinsert the LT-Mold. However, at 3 month endoscopy, we did not find the stent in situ. It had probably been expelled again. Unfortunately, the child had again developed a glottic web and is awaiting a second intervention [Figure 3]. Among patients who underwent Montgomery T-tube stenting, one had persistent tracheal stenosis after T-tube removal and was managed by salvage TRAA. Another patient expired at home, possibly due to tube block. One patient in the TRAA group developed complete anastomotic dehiscence at 7th postoperative day. Montgomery T-tube stenting was done for 7 months. Subsequent endoscopy revealed upper and lower tracheal stumps separated by intervening segment formed by fibrosis. Silicone tube stent was inserted and secured to trachea by prolene 2-0 sutures passed through the silicone tube [Figure 4]. He awaits further reassessment. Another patient developed re-stenosis after TRAA and was subsequently tracheostomized. He did not give consent for any further surgeries and was subsequently lost to follow-up. A total of 5 patients underwent resection-anastomosis in the form of PCTR, of which two were double stage. Two patients underwent a successful extended-PCTR. A young man underwent a cricotracheoplasty with anterior costal cartilage grafting for a long segment combined subglottic and tracheal stenosis. However, he developed restenosis and required salvage PCTR. One patient had Grade 4 tracheal stenosis and PGS following accidental strangulation. She first underwent expansion laryngoplasty with posterior costal cartilage grafting and LT-Mold stenting for 3 months. Tracheal stenosis was managed at the second stage by resection and anastomosis. This group includes four patients of severe type III laryngomalacia, three of whom underwent external hyo-epiglottopexy, wherein the epiglottis was pulled anteriorly and secured to the hyoid bone by 2-0 polydioxanone sutures. One patient underwent glosso-epiglottopexy. All of them have been symptom-free since then. We had two aphonic patients of suicidal corrosive injury who underwent CO2 laser release of the fibrotic bands over multiple sittings till the endolarynx with normal cords was visualized. Both of them regained their voice and were then referred for further treatment to the gastrosurgery department. One patient, a 2-year-old girl with a congenital web between the false vocal cords underwent successful endoscopic release with sickle knife. A young man with supraglottic stenosis following multiple laser interventions underwent laryngofissure with excision of supraglottic stenosis along with posterior cricoid split and costal cartilage grafting. However, he spontaneously expelled his LT-Mold within 2 weeks and has subsequently developed restenosis and subglottic tracheoesophageal fistula [Figure 5]. He remains tracheostomized and is awaiting a revision surgery. Overall, out of 106 patients treated for LTS at our institute, 100 have been successfully decannulated– a decannulation rate of 94.3%. Postoperative complications included complete anastomotic dehiscence (1), spontaneous LT-Mold expulsion (8), and restenosis (5). One patient expired at home 1 month after undergoing Montgomery T-tube stenting. Exact cause of death could not be ascertained but was possibly due to tube block. LTS is a recalcitrant disease with high morbidity. Benign LTS may result from various insults to the upper airway, including endotracheal intubation, tracheostomy, blunt or penetrating trauma, congenital lesions, and radiotherapy. Of these, prolonged intubation is the single largest cause of LTS. Prolonged intubation with assisted ventilation formed the largest etiological group in our series as well. 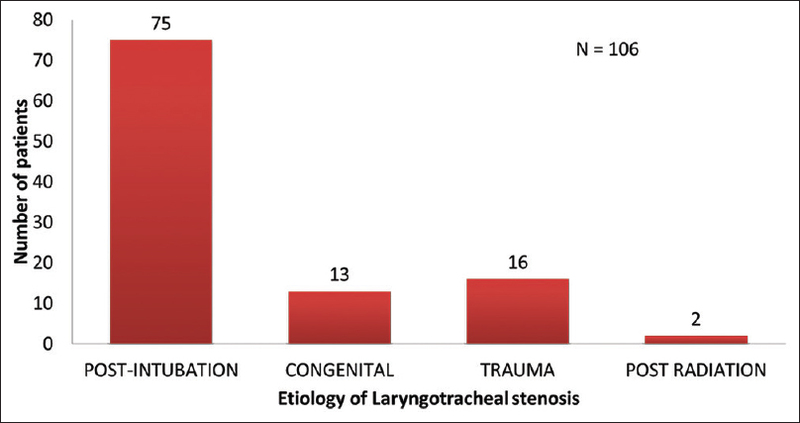 Reported incidence of tracheal stenosis following tracheotomy and laryngotracheal intubation ranges from 0.6%–21% to 6%–21%, respectively. The incidence of laryngeal stenosis following intubation ranges from 2% to 12%. Ninety percent of cases of subglottic stenosis in children are secondary to endotracheal intubation. The main factors responsible for causing postintubation stenosis include the duration of intubation, size of tube relative to lumen, cuff pressure, movement of tube during the period of intubation, and cuff material. The incidence of postintubation LTS in ICUs has significantly reduced with the introduction of endotracheal tubes with high volume, low pressure cuffs., There seems to be no consensus in literature on the safe time limit before considering tracheostomy in an intubated patient. We generally consider 3–5 days as the optimum period since 76% of patients with postintubation stenosis in our series had been intubated for >5 days. LTS is seen more commonly in the age group of 26–34 years., Young, adult males formed the largest subgroup in our review. They are generally more prone to road traffic accidents and assault injuries. In the rural regions catered to by our institute, suicidal poisoning by ingesting organophosphates (used as pesticides in fields), was the single largest cause of prolonged intubation; this again was common in male farmers. Organophosphates cause acute respiratory failure by inhibiting acetylcholinesterase and require prolonged mechanical ventilation. Detailed and accurate endoscopy of larynx and trachea, as described above, forms an indispensable component of preoperative evaluation in these patients. Indirect laryngoscopy, dynamic TNFL, and rigid 0° endoscopy under general anesthesia are done to determine vocal cord mobility, site, grade, and length of stenosis. Vocal cord immobility due to neurogenic cause must be differentiated from PGS by suspension microlaryngoscopy, as management may significantly differ between the two groups. As far as possible, endoscopic airway evaluation should be done even in a patient presenting with stridor and respiratory distress. This allows the clinician to establish the cause, site, and severity of airway obstruction, which in turn may influence the emergent treatment. The site of stenosis guides the surgeon to appropriate site of tracheostomy. An early, short-segment stenosis maybe be managed by dilatation and tracheotomy avoided. The presence of airway inflammation and edema should also be noted. We routinely send tracheal swab for culture and antibiotic sensitivity in all patients. Those with signs of inflammation in respiratory mucosa or presence of antibiotic-resistant organisms are not immediately taken up for surgery, especially, where resection-anastomosis is required as they have a higher chance of complications such as anastomotic dehiscence. We optimize their nutrition by advising high-protein diet and other supplements to boost their immunity. A repeat tracheal swab is generally sent after 1–3 months of waiting period; the surgery is planned only if the swab result is satisfactory. There should be antibiotic sensitivity to more than two drugs. Various treatment modalities have been described in literature. The choice of treatment depends on the site, grade, and length of stenosis, as well as on patient comorbidities, history of previous interventions, and on the expertise of the surgical team. The goal should be to achieve a patent airway, glottic competence to protect against aspiration, and an acceptable voice quality. Various forms of treatment include laser, repeated endoscopic dilatations, prolonged stenting, LTR and segmental resection with end-to-end anastomosis. Endoscopic management of LTS requires a careful selection of patients. We reserve endoscopic techniques for short segment, fresh (or early) subglottic, and tracheal stenosis. For subglottic stenosis, we perform radial incisions using sickle knife followed by dilatation. For tracheal stenosis, we employ dilatations with gradually increasing diameters of rigid bronchoscopes. We prefer bronchoscopes as bougies tend to make the procedure blind and increase the risk of complications such as pneumothorax. As far as open surgical techniques go, there are two broad categories: (a) resection of the stenotic segment with end-to-end anastomosis and (b) various forms of LTRs without resection of stenotic segment. The basic principles of any airway resection and anastomosis include meticulous dissection, preservation of recurrent laryngeal nerves and tracheal blood supply, and avoidance of excessive tension on the anastomosis. The tracheal ring used for the anastomosis should be healthy and steady to prevent dehiscence as well as delayed tracheomalacia at the site of the anastomosis. Sutures should always be placed in the submucosal plane since the breach of mucosa tends to cause granulations at the suture line. In cases of long-segment tracheal stenosis, laryngeal release procedures may be required to avoid excessive tension at the suture line., We have generally used infrahyoid release in our patients without any issues. Although Kato et al. showed that outcome regarding swallowing was better with the suprahyoid release, George et al. have used infrahyoid release in all their patients without any adverse effects on deglutition. The inherent advantage of a resection-anastomosis procedure is that the diseased airway is completely removed with formation of a healthy, mucosalized “new” airway which should not be prone to restenosis, thus, giving this technique the highest possibility of success. LTR techniques have been developed to avoid airway resection in two broad scenarios: (a) where resection is not necessary, i.e., less severe stenosis or (b) where resection is not possible, i.e., long-segment stenosis, associated glottic stenosis, or stenosis without residual subglottic space. LTR generally involves anterior and/or posterior division of cricoid cartilage with interposition of an autologous costal cartilage graft. Insinuation of the cartilage graft serves to expand the stenotic airway, and when used for PGS, it interposes nonscar tissue between the edges of the surgically divided posterior commissure scar and thus prevents its recurrence. An intraluminal stent is required to hold or splint the reconstructed area in place and prevent its disruption secondary to laryngeal movements in breathing and swallowing. It also contracts the scar tissue and promotes a scaffold for epithelium to cover the lumen of the airway. We have consistently used the LT-Mold for laryngeal stenting because of its soft, smooth, and pliable nature that conforms to the inner laryngeal contours. In addition, the presence of a silicone integrated cap prevents pressure necrosis and granulation tissue formation at the distal extremity. We prefer to stent the airway for around 3 months. A similar procedure of tracheoplasty with anterior costal cartilage grafting and T-tube stenting can be done to expand the stenotic airway in long-segment tracheal stenosis which precludes an airway resection. Our experience with this technique is limited. We have performed this in only one patient who later required salvages PCTR for restenosis. Contrary to the excellent results of resection-anastomosis, LTRs have not been as successful especially in severe subglottic stenosis. In our own series, LTR has been successful in 81.9% patients. This is mainly attributed to careful patient selection, which is, utilizing LTR only for mild-to-moderate subglottic stenosis. Glottosubglottic stenosis can be very challenging to treat. Extended PCTR with posterior cricoid split and costal cartilage grafting provides better results than LTR with anterior and posterior cartilage grafts. In extended PCTR, the pedicled flap of membranous trachea used to reline the cartilage graft provides a fully mucosalized subglottic airway. This mucosal cover is important to prevent rescarring. We have performed extended-PCTR in 10 patients with a successful outcome in nine. Wright et al. have identified a few factors that increase the risk of anastomotic complications after tracheal resection-reoperation, diabetes, lengthy resections, laryngotracheal resections, young age (pediatric patients), and the need for tracheostomy before surgery. Inflammation of airway mucosa, infection (especially by multidrug-resistant organisms), suboptimal suture material, and poor suturing technique are associated with an increased risk of postoperative complications. Anastomotic dehiscence is the most dreaded complication following a resection procedure. We have faced this in only one of our patients. He required long-term stenting with a silicone tube and is yet to be decannulated. Postradiotherapy stenosis constitutes another difficult group. These patients are expected to have a high rate of anastomotic complications owing to poor healing capacity of radiotherapy-affected mucosa. Reconstructive surgeries with stenting also have a higher chance of failure in them owing to their tendency to undergo recurrent fibrosis and stenosis. If one decides to operate on them, it must be with a guarded prognosis. An issue that we have faced with LT-Mold is its spontaneous expulsion in 8 out of 21 patients, a rather high number. The patients coughed out their LT-Mold 1–4 weeks following surgery. The probable causes for this could be infection or poor quality of suture material. Four of these developed restenosis; of which three underwent revision surgery. In the latter four patients, we reinserted the expelled LT-Mold through the tracheostoma by securing it to the upper end of a Montgomery T-tube, thus avoiding restenosis. 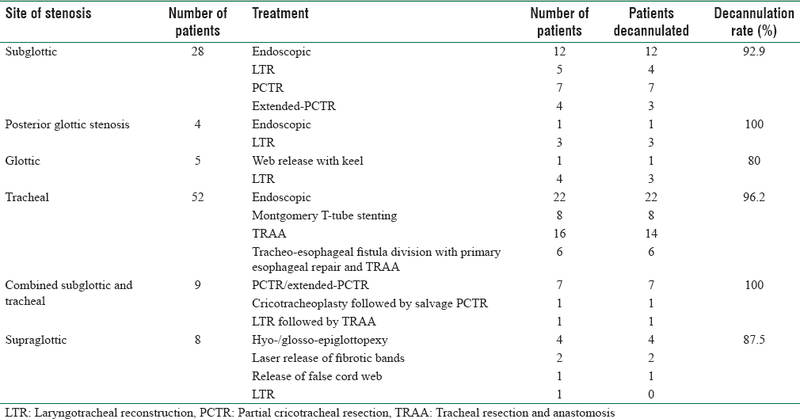 Most LTS series published in literature include a substantial proportion of salvage surgeries as a result of procedures done in smaller centers before referral to tertiary care centers. In our series, 19.8% of the patients had had one or more surgeries before referral to us. Even though the final outcome in this group was similar to the “per-primum” patients, their management was more complex and technically difficult. We could not use endoscopic techniques in any of these patients; all of them required an open procedure. A “badly done resection” can preclude further resections and in such cases, reconstructive techniques may become the only salvage option. Salvage options are limited and technically very challenging. For a disease as complex as LTS, the first chance is always the best chance. Use of appropriate size, low-pressure cuffed tubes and early tracheostomy will go a long way in preventing LTS. A precise assessment of laryngotracheal complex is the cornerstone of LTS management. The choice of treatment depends on the location, severity, and length of stenosis, as well as on patient comorbidities, history of previous interventions, and on the expertise of the surgical team. The goal of any treatment modality should be to achieve a patent airway, glottic competence, and an acceptable voice quality. The authors would like to express their sincere gratitude to Prof. Philippe Monnier, Professor Emeritus, University of Lausanne, for his immense guidance and help in managing the challenging cases of laryngotracheal stenosis. Grillo HC, Donahue DM, Mathisen DJ, Wain JC, Wright CD. Postintubation tracheal stenosis. Treatment and results. J Thorac Cardiovasc Surg 1995;109:486-92. Sarper A, Ayten A, Eser I, Ozbudak O, Demircan A. Tracheal stenosis aftertracheostomy or intubation: Review with special regard to cause and management. Tex Heart Inst J 2005;32:154-8. Massoud EA, McCullough DW. Adult-acquired laryngeal stenosis: A study of prognostic factors. J Otolaryngol 1995;24:234-7. Mathias DB, Wedley JR. The effects of cuffed endotracheal tubes on the tracheal wall. Br J Anaesth 1974;46:849-52. Spittle CS, Beavis SE. Post-intubation tracheal stenosis. Hosp Med 2001;62:54. Ahmad I, Pahor AL. Post-intubation tracheal stenosis. Hosp Med 2000;61:508-9. Cherian TA, Rupa V, Raman R. External laryngeal trauma: Analysis of thirty cases. J Laryngol Otol 1993;107:920-3. Yen PT, Lee HY, Tsai MH, Chan ST, Huang TS. Clinical analysis of external laryngeal trauma. J Laryngol Otol 1994;108:221-5. Bull PD. Evaluation of the pediatric airway by rigid endoscopy. In: Cotton RT, Myer CM 3rd, editor. Practical Pediatric Otolaryngology. Philadelphia, PA: Lippincott- Raven; 1999. p. 477. Gallo A, Pagliuca G, Greco A, Martellucci S, Mascelli A, Fusconi M, et al. Laryngotracheal stenosis treated with multiple surgeries: Experience, results and prognostic factors in 70 patients. Acta Otorhinolaryngol Ital 2012;32:182-8. Monnier P, George M, Monod ML, Lang F. The role of the CO2 laser in the management of laryngotracheal stenosis: A survey of 100 cases. Eur Arch Otorhinolaryngol 2005;262:602-8. Oh SK, Park KN, Lee SW. Long-term results of endoscopic dilatation for tracheal and subglottic stenosis. Clin Exp Otorhinolaryngol 2014;7:324-8. Perepelitsyn I, Shapshay SM. Endoscopic treatment of laryngeal and tracheal stenosis-has mitomycin C improved the outcome? Otolaryngol Head Neck Surg 2004;131:16-20. Simpson CB, James JC. The efficacy of mitomycin-C in the treatment of laryngotracheal stenosis. Laryngoscope 2006;116:1923-5. Liew YT, Yong DJ, Somasundran M, Lum CL. Management experience of subglottic stenosis by endoscopic bougie dilatation with mitomycin C and review of literature: Case series. Indian J Otolaryngol Head Neck Surg 2015;67:129-33. George M, Lang F, Pasche P, Monnier P. Surgical management of laryngotracheal stenosis in adults. Eur Arch Otorhinolaryngol 2005;262:609-15. Marques P, Leal L, Spratley J, Cardoso E, Santos M. Tracheal resection with primary anastomosis: 10 years experience. Am J Otolaryngol 2009;30:415-8. Hassan FH, Goh BS, Kong MH, Marina MB, Sani A. Tracheal resection and anastomosis: An 11 year management outcome. Rawal Med J 2013;38:177-80. Pearson FG, Cooper JD, Nelems JM, Van Nostrand AW. Primary tracheal anastomosis after resection of the cricoid cartilage with preservation of recurrent laryngeal nerves. J Thorac Cardiovasc Surg 1975;70:806-16. Monnier P, Lang F, Savary M. Cricotracheal resection for pediatric subglottic stenosis. Int J Pediatr Otorhinolaryngol 1999;49 Suppl 1:S283-6. Montgomery WW. Suprahyoid release for tracheal anastomosis. Arch Otolaryngol 1974;99:255-60. Dedo HH, Fishman NH. Laryngeal release and sleeve resection for tracheal stenosis. Ann Otol Rhinol Laryngol 1969;78:285-96. Kato I, Iwatake H, Tsutsumi K, Koizuka I, Suzuki H, Nakamura T, et al. End-to-end anastomosis in chronic tracheal stenosis. Auris Nasus Larynx 2003;30 Suppl:S69-73. Monnier P. Laryngotracheoplasty and laryngotracheal reconstruction. In: Monnier P, editor. Pediatric Airway Surgery: Management of Laryngotracheal Stenosis in Infants and Children. Berlin, Heidelberg: Springer Berlin Heidelberg; 2011. p. 257-77. Pradhan T, Kapil S, Thakar A. Posterior cricoid split with costal cartilage augmentation for high subglottic stenosis. Indian J Otolaryngol Head Neck Surg 2008;60:147-51. Alshammari J, Monnier P. Airway stenting with the LT-MoldTM for severe glotto-subglottic stenosis or intractable aspiration: Experience in 65 cases. Eur Arch Oto Rhino Laryngol 2012;269:2531-8. Hoasjoe DK, Franklin SW, Aarstad RF, Day TA, Stucker FJ. Posterior glottic stenosis mechanism and surgical management. Laryngoscope 1997;107:675-9. George M, Jaquet Y, Ikonomidis C, Monnier P. Management of severe pediatric subglottic stenosis with glottic involvement. J Thorac Cardiovasc Surg 2010;139:411-7. Wright CD, Grillo HC, Wain JC, Wong DR, Donahue DM, Gaissert HA, et al. Anastomotic complications after tracheal resection: Prognostic factors and management. J Thorac Cardiovasc Surg 2004;128:731-9.